Remy Bishop is a thirty year-old divorcee living in the San Francisco Bay Area. She is recovering from being fired as a forensic technician for falsifying lab results. She’s determined to clear her name and nail the person who forged her signature. With her parents help, she changes careers.She has just secured her first paid position as an appraiser at the LaneWilson auction house when she takes on a client, a man who wants her to appraise an antique for his aunt. Remy visits the grand mansion and is pleased to find the antique is the real deal. When she returns for a written contract she discovers the client is murdered, the house is empty, there is no aunt and the antique is missing. Remy is the only person who had contact with the man and the antique. Now she’s a suspect in his death.Meantime, she had agreed to help an elderly woman find a family heirloom, which the elderly woman is accusing the auction house of stealing. 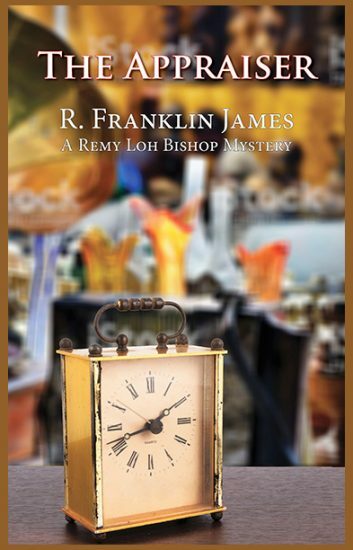 A pattern of crime and deceit begin to weave together a picture but not the one Remy thought. She continues to push back on the murder even as she walks the thin line of once more being accused of evidence tampering. It isn’t until she’s the prime suspect in a second murder that her own background comes to light and she discovers that betrayal comes easy to some and murder even easier to others.